Predator control: Introduced predatory mammals pose a serious threat to all New Zealand birds. 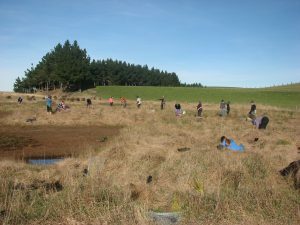 Habitat conservation: The Trust’s work involves the conservation of hoiho breeding habitats. Research projects: A variety of research projects have been undertaken to learn more about the penguins. Threats: For over one thousand years, humans have unwittingly brought to New Zealand many threats to add to the penguins’ plight. Nursery: The Trust established a plant nursery to grow plants for revegetating hoiho habitats. Education: The Trust provides information on penguin conservation to the public, and advocates for the hoiho’s ongoing protection. Our conservation programme involves Trust owned or managed reserves, with some aspects covering the entire range of hoiho.